This book provides a comprehensive overview of WHOIS. The text begins with an introduction to WHOIS and an in-depth coverage of its forty-year history. Afterwards it examines how to use WHOIS and how WHOIS fits in the overall structure of the Domain Name System (DNS). Other technical topics covered include WHOIS query code and WHOIS server details. The book also discusses current policy developments and implementations, reviews critical policy documents, and explains how they will affect the future of the Internet and WHOIS. Additional resources and content updates will be provided through a supplementary website. Visit the book's companion website http://whois.knujon.com for technical and policy documents concerning WHOIS, WHOIS code examples, internet locations for WHOIS databases and more. 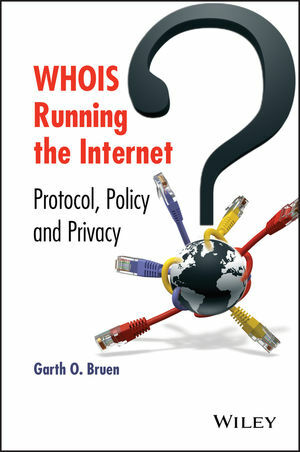 WHOIS Running the Internet: Protocol, Policy, and Privacy is written primarily for internet developers, policy developers, industry professionals in law enforcement, digital forensic investigators, and intellectual property attorneys. Garth O. Bruen is an Internet policy and security researcher whose work has been published in the Wall Street Journal and the Washington Post. Since 2012 Garth Bruen has served as the North American At-Large Chair to the Internet Corporation of Assigned Names and Numbers (ICANN). In 2003 Bruen created KnujOn.com with his late father, Dr. Robert Bruen, to process and investigate Internet abuse complaints (SPAM) from consumers. Bruen has trained and advised law enforcement at the federal and local levels on malicious use of the Domain Name System in the way it relates to the WHOIS record system. He has presented multiple times to the High Technology Crime Investigation Association (HTCIA) as well as other cybercrime venues including the Anti-Phishing Working Group (APWG) and the National Center for Justice and the Rule of Law at The University of Mississippi School of Law. Bruen also teaches the Fisher College Criminal Justice School in Boston where he develops new approaches to digital crime.